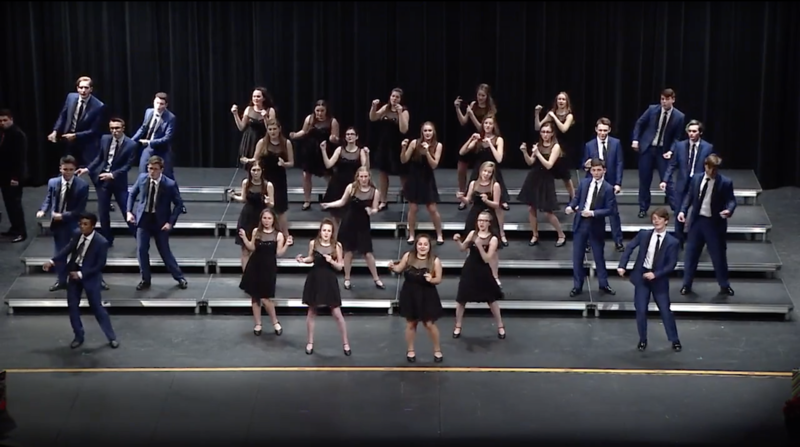 Vocal Impact is an extracurricular show choir that consist of students in grades 9-12. Vocal Impact combines singing and dancing in its most unique form. Students in Vocal Impact are dedicated students that attend two, 2 hour rehearsal every week. The group is lead by Mr. Jacob Moore, music director, and Mr. Brian Rodabaugh, choreographer. Mr. Moore and Mr. Rodabaugh hold the group to a very high standard, which is met each time the group walks through the doors. Vocal Impact sings a variety of music ranging from old classics to modern pop, and everything in between. Students will be challenged to become better musicians each and every day. 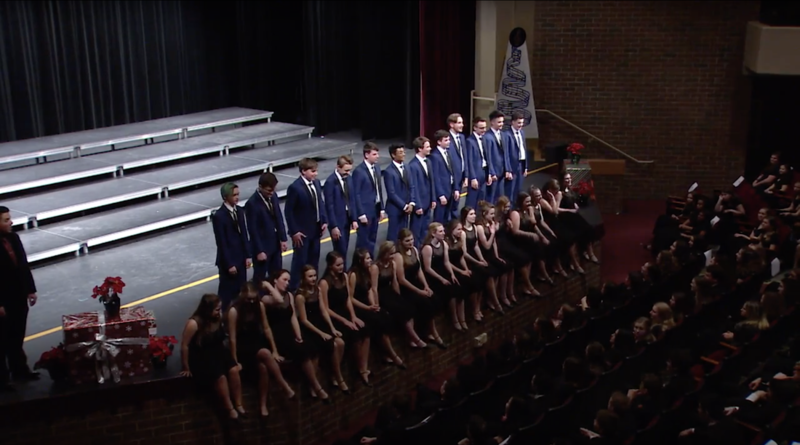 Vocal Impact performs at all four of the choir concerts throughout the year, as well as through the Hudson community and the Northeast Ohio community at large. 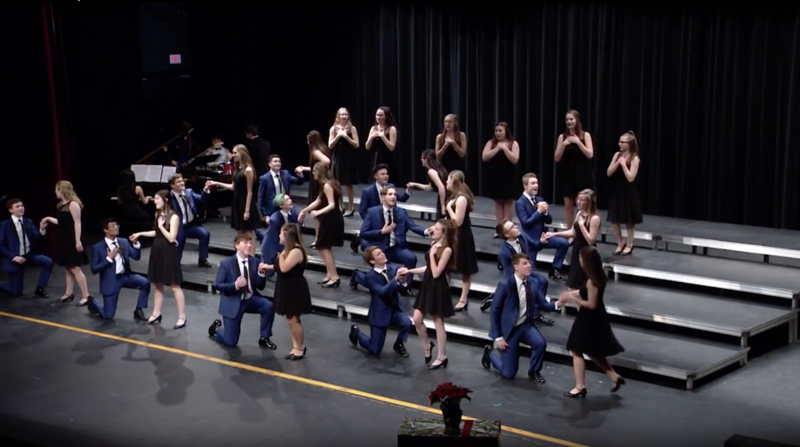 This year they have been invited to and will perform at the Brecksville-Broadview Heights High School Show Choir Festival, the Walsh Jesuit Great Lakes Show Choir Competition, and will host their own Vocal Impact Invitational on Friday January 19th, 2018. The audition to earn a spot in Vocal Impact is a three day process. Students interested in auditioning for Vocal Impact should prepare the following. - Students may choose any song that they would like to audition in front of Mr. Moore & Mr. Rodabaugh. There are no limits on what song a student may sing. The only requirement is that it must show off your voice in the span of thirty seconds to one minute. - On Day 2, Mr. Rodabaugh will lead the group through a dance. After the dance is learned, students will perform it twice in groups of 6 or 7 students, to be judged by Mr. Moore & Rodabaugh. Students are encouraged to bring a pair of comfortable shoes to dance in. Should you make it into the group, ladies will be required to purchase a pair of character shoes, and gentlemen a pair of black loafers. Students should dress comfortably. - On the morning of day 3, a callback list will be posted outside the choir room, D100, with a callback list. These students will return for one more day of auditions, that includes learning a song, and the dance that accompanies it. We've heard you sing, we've seen you dance, now we need to see if you can do them both at the same time. Students whose names do not appear on the callback list are not being considered for the group. The final list is posted after the group has been decided. This process can take as little as a day, and as long as a weekend to complete. Any further questions about Vocal Impact can be directed to Mr. Jacob Moore at moorej@hudson.k12.oh.us.